These days, Eugen Systems are most known for their deliciously complex wargame RTS hybrid series, the latest of which was Wargame: Red Dragon. But before that, they built slightly more traditional strategy games, like Act of War, with base building and resource management. Now the studio is going back, working on Act of Aggression, a successor to Act of War. Turtling away, building stalwart bases, obsessing over resource management and production – it’s all back. 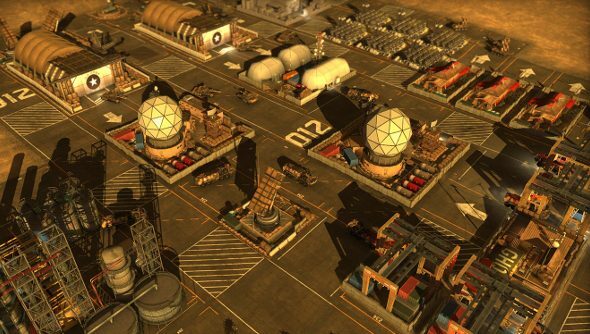 Eugen wants to “bring about a return to the 90’s Golden Era of real time strategy games,” and if anyone can do it, my money is on them. Check out the very aggressive teaser below. Bases! Artillery! Helicopters! Explosions! It looks like Act of Aggression has it all, and it’s really quite pretty. Though that’s hardly a surprise given Eugen’s experience developing engines that are both extremely functional and lovely to look at. In the last decade, I’ve definitely moved towards being a wargame addict, leaving behind traditional RTSs because there simply aren’t many around. Act of Aggression, though, that could change things. And while there are almost certainly going to be those who claim Eugen is trying to dilute strategy and dumb things down with the new game, they’ve probably just forgotten how wonderful complex and deep a really good RTS can be. Hopefully Act of Aggression will remind them.